Home » Reigns of Henri IV. and Louis XIII. Renaissance, baroque fashion history. France 16th to 17th century. Universal mourning on the death of the Guise. Caricatures: “Pompe funèbre de la Mode”. The Frondeuses – Mme. de Longueville. 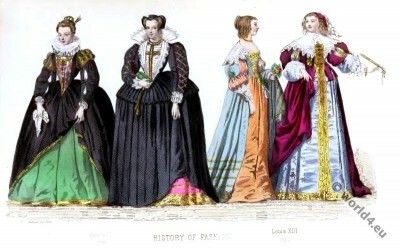 Universal mourning on the death of the Guises; intolerance of showy dress — Vertugadins, “espoitrement,” “corps espagnole” — Diversity of colours — The pearls, jewels, and diamonds belonging to Gabrielle d’Estrees and to the queen — Dress of Marguerite de France — Low-cut bodices — Head-dresses of hair — Various styles — Venetian slippers — Edicts of Louis XII. 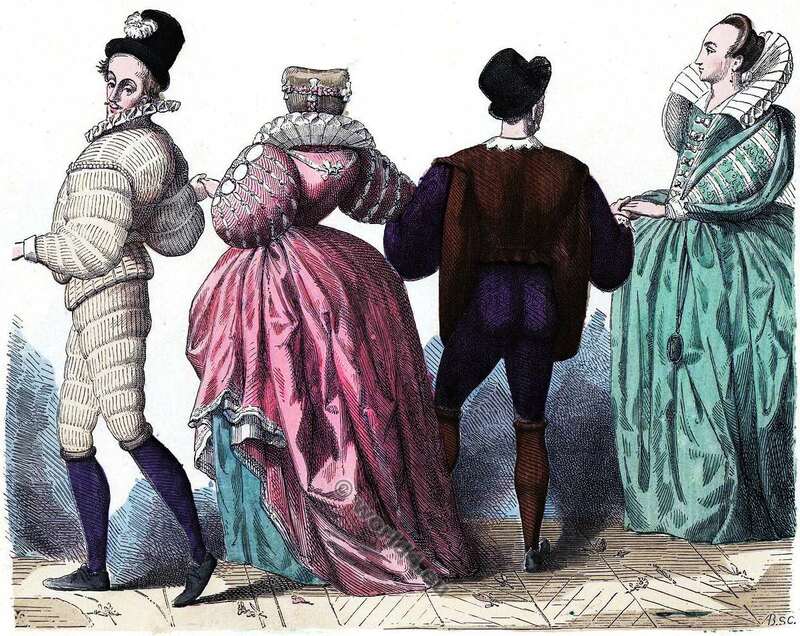 — Caricatures: “Pompe funèbre de la Mode” — Words and fashions — Ribbons or “galants” — Dress of widows — “Demi-ceint” girdles — Gloves of all sorts – Patches — Masks; their use — “Cache-laid” — The Frondeuses — Mme. de Longueville. 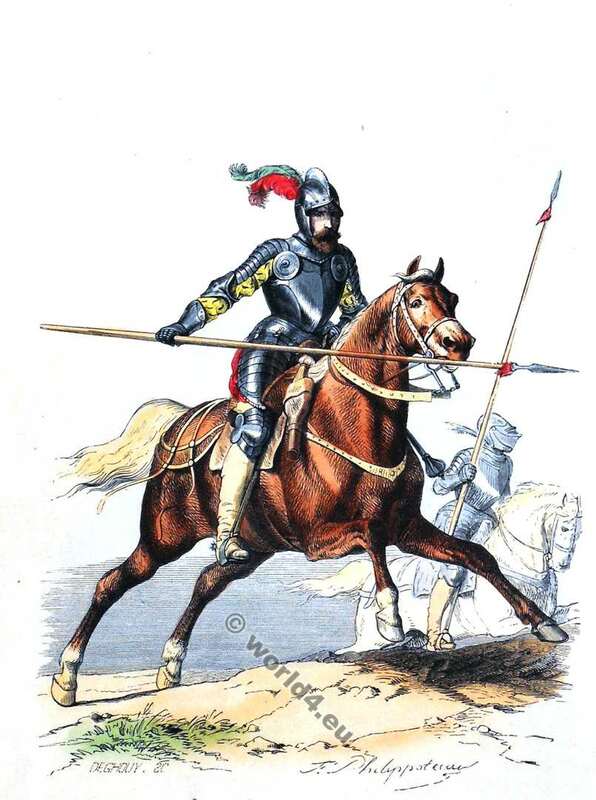 Chevau-légers. 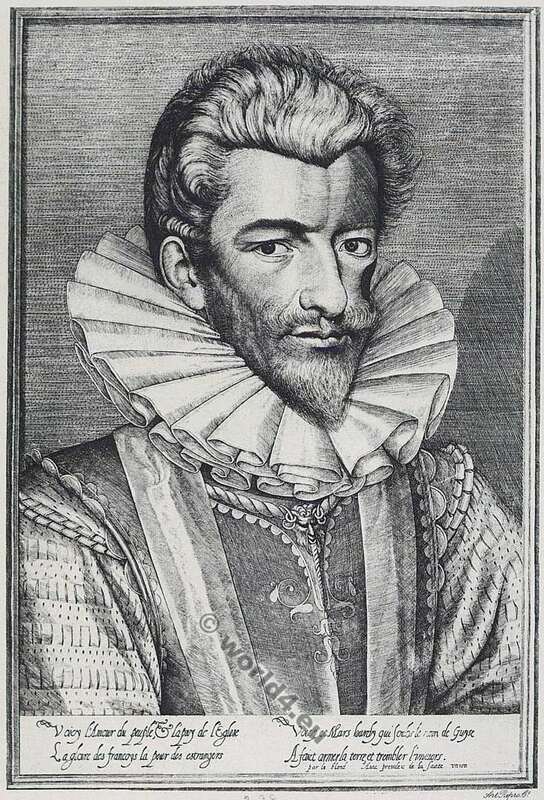 1560 à 1600. 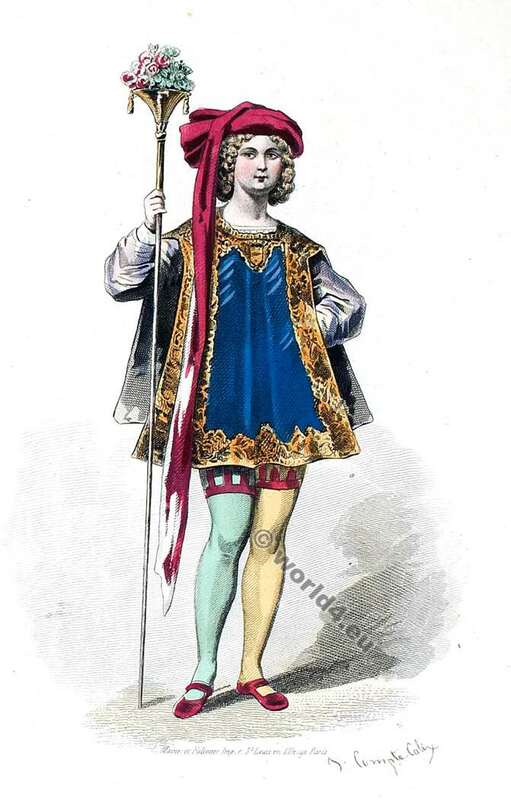 La garde du roi Henry IV. Sergent en armure. 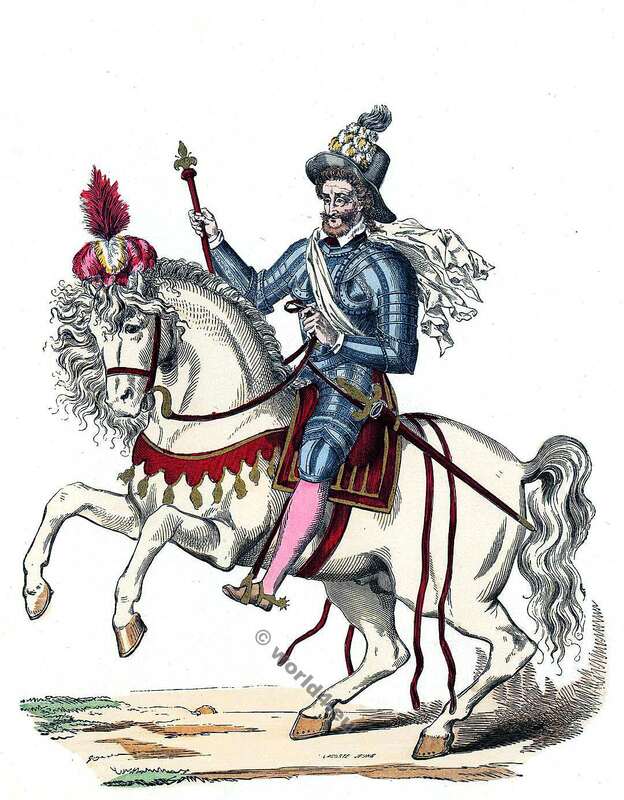 Henri de Lorraine, Du de Guise. From an Engraving by Le Blond, in the British Museum. But this, we repeat, was an exception. In the most troubled times of our history, fashion and luxury appear to have yielded none of their rights. 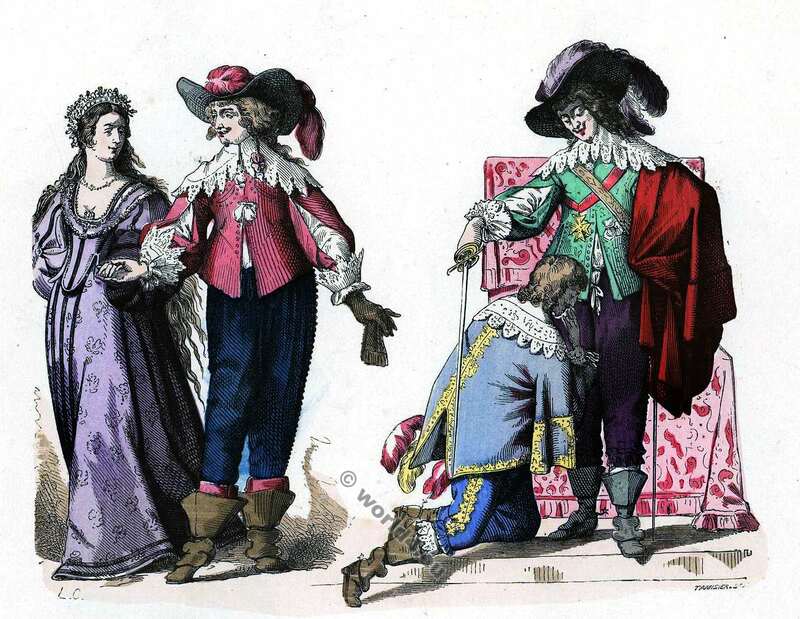 Frenchmen, and still more Frenchwomen, feel so imperious a need of pleasure! Ennui comes to them so readily! The love of admiration, or to speak more accurately, the love of elegance and of change is so deeply rooted in the national character. If luxury did not exist in France, we should be compelled to invent it. When it vanishes, we think that all is lost—even our country! The vertugadin consisted of circles of iron, wood, or whalebone, “resembling the hoops of casks.” These were sewn inside the skirts. It dated from the first half of the sixteenth century, but attained no extraordinary size under the Valois. Many eccentricities may be laid to their charge, as we have seen, but on this point they were tolerably reasonable. The vertugadin came to us direct from Spain. 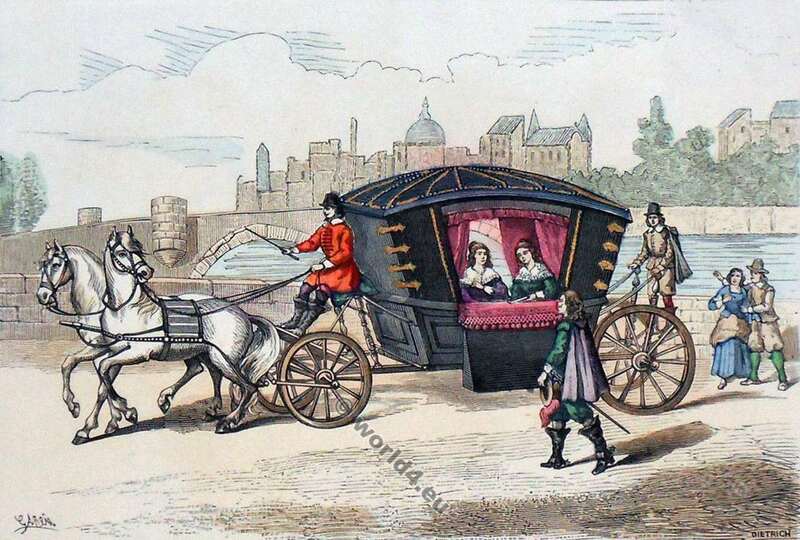 “In order to obtain a real Spanish figure,” says Montaigne, “what a gehenna of suffering will not women endure, drawn in and compressed by great ‘coches’ entering the very flesh; nay, sometimes they even die thereof? During the reign of Henri IV. the gigantic size of the vertugadin, in spite of satire and sarcasm, was not lessened by one inch. In vain was its absurdity manifest. The ladies nearly all looked “like church bells,” to make use of a metaphor for which other historians are responsible. 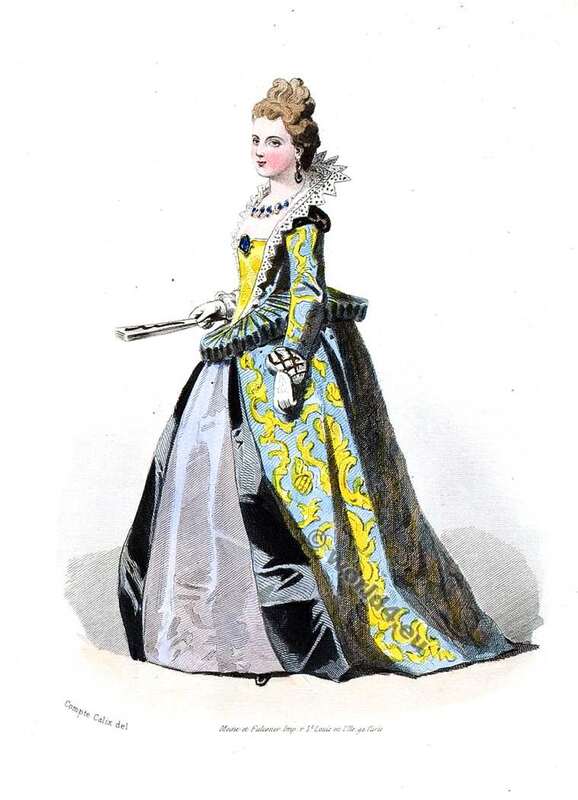 Their bodices were usually buttoned in front, and were cut square at the waist; but they often wore long pointed bodices partially opened in front, and disclosing a white chemisette elegantly trimmed with embroidery or lace. Lace was lavished on every part of the gown—on the wrists, sleeves, and back. Frenchwomen wore colours, and great was their number—from “rat-colour” to that called “widow’s joy,” or “envenomed monkey,” or “chimney-sweep,” according to D’Aubigné (Théodore Agrippa d’Aubigné 1552-1630). The display of diamonds was destined to increase as time went on. Henry IV. King of France 1553-1610. The reign of the vertugadin, which Mme. de Motteville (Françoise Bertaut de Motteville (c. 1621 – 1689) described as “a round and monstrous machine,” came to an end in 1630. But red silk stockings, called “has de fiammette,” costing more than seventy-five francs a pair, shoes with flaps fastened by a love-knot “à la Choisy” in blue or red satin, and crimson velvet, pattens with high cork soles, survived the vertugadin, as did likewise velvet, miniver, and ermine muffs in winter. Marguerite de France (Marguerite de Valois; 1553 – 1615, also known as La Reine Margot, was Queen of France and Navarre and Duchess of Valois. ), the daughter of Henri II. and wife of Henri IV., is depicted wearing the following costume: Pearl necklace and earrings, open-work fan, kid gloves completely covering the hands and wrists, where they were drawn under white cuffs, a cap, since known as the Marie Stuart cap, her hair frizzed and drawn up symmetrically over the forehead, an under-dress of black satin, the upper one trimmed with gimp, an open fluted collerette, and an immense ruff reaching to the nape of the neck. Marguerite de France, whom courtiers called “the goddess,” was extraordinarily beautiful, and was graceful, lively, and fascinating in the highest degree. 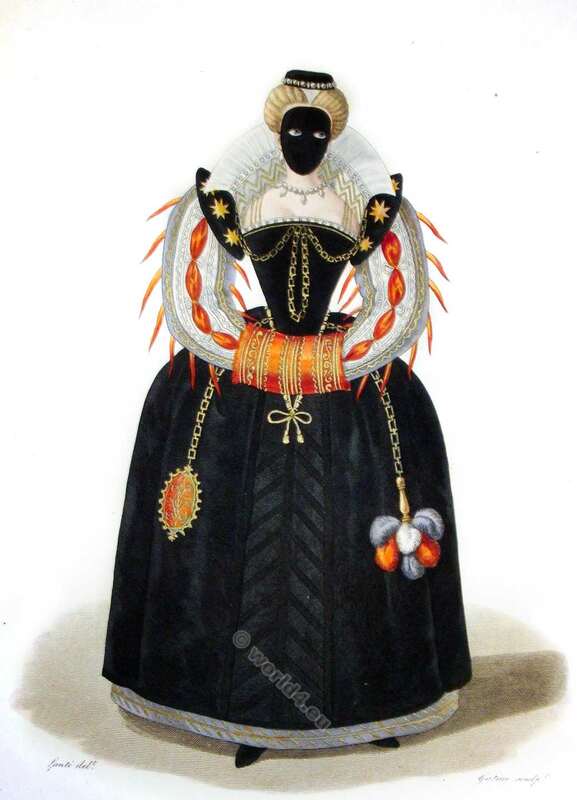 Her “carrures” (shoulder-breadths) and skirts were made by her orders, it is said, much wider than was necessary. She was enormously stout, and by way of improving her figure applied steel bands to each side ot her waist. There were, it seems, not a few doors through which the fair princess could not pass. 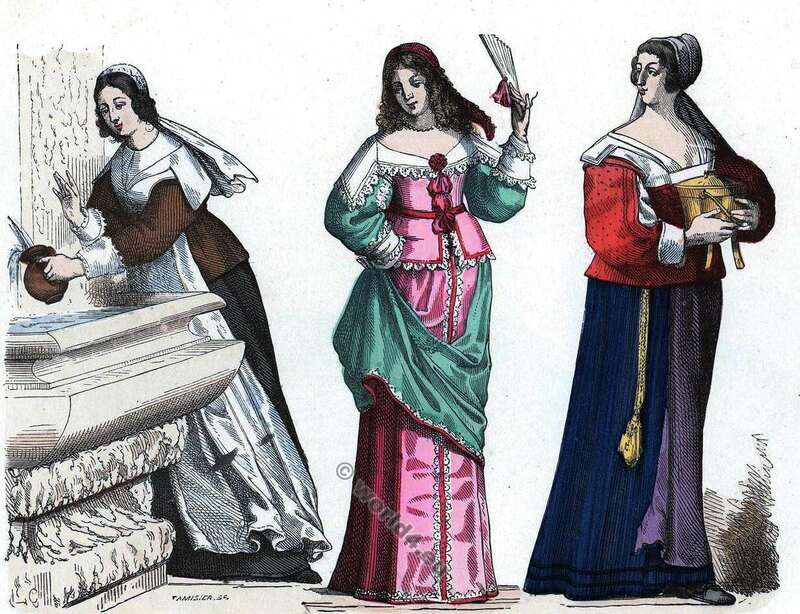 Gowns were made not only of satin but of velvet, damask, and silk of every colour. 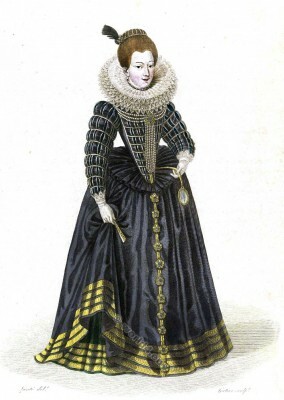 There were dresses “à collets débordés,” or with collars falling over the shoulders and upper part of the arm; there were ruffs “à grands godrons,” so cut out and open-worked that the skin was easily discernible behind them; there were belts of exorbitant price, to which were suspended needle-cases, gold-handled scissors, and gold-braided velvet purses. But the thunderbolts of the Church were hurled in vain, and light, transparent, and low-cut gowns enjoyed a long career. The Vatican and the French Parliament might speak if they chose, but they could not prevail against the customs of the day. Veneur au 16ème siècle. D’après M. Lechevalier-Chevignard. 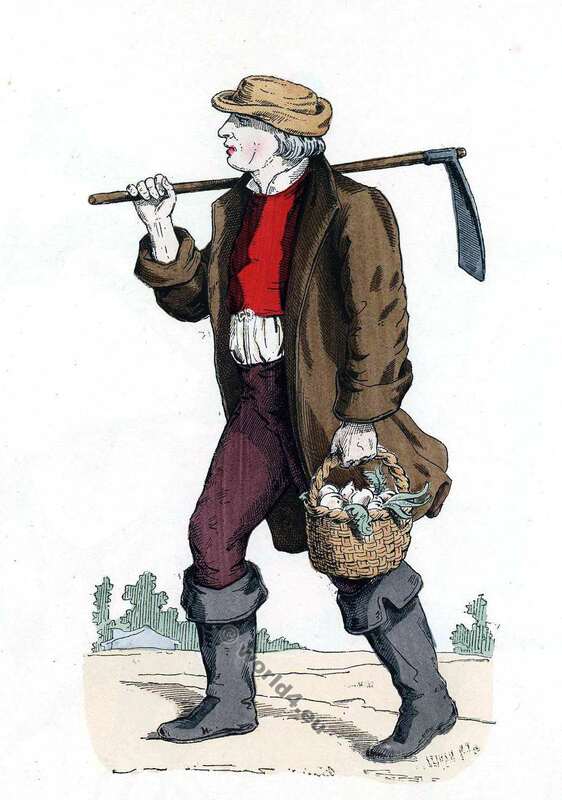 Paysan laboureur français du 16ème au 18ème siècle. Tiré du Recueil de la diversité des habits, d’après Chevignard. 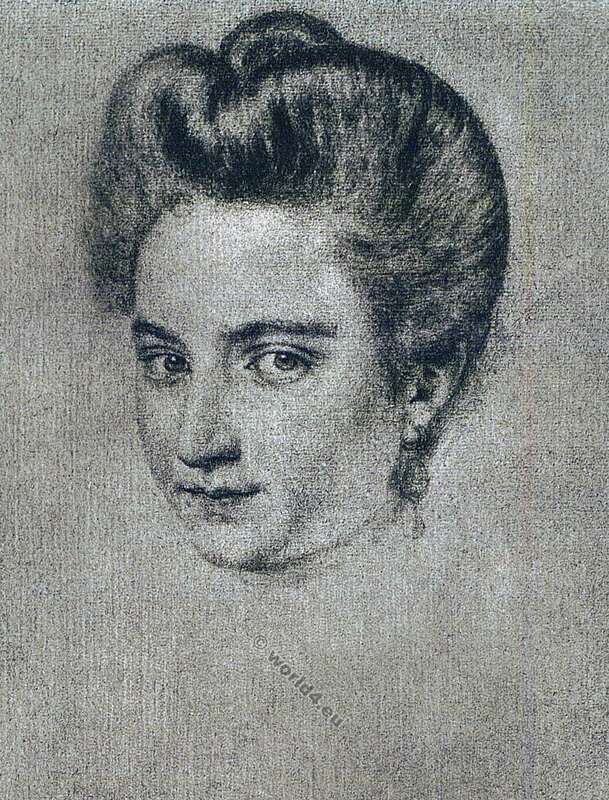 Dating from the year 1587, one of the last years of the troubled reign of Henri III., women had taken a violent fancy to wearing hair only as a head-dress, surmounted by a feather. They wore false hair or wigs powdered with violet powder for brunettes, and with iris for fair women. A sort of gum or mucilage kept the hair in its place; their heads seemed to be pasted. The women of the people made use of the dust of rotten oak, and the peasants of flour for the same purpose. There were four different styles of head-dresses of the period:— First, the “coiffure à boucles frisées,” or curled ringlets, the style of which is sufficiently indicated by its name; secondly, that “à passe fillons;” thirdly, that “à oreillettes,” a hat with a high crown, the material of which being crumpled of itself (naturellement chiffonnée) fell into a quantity of little folds; and, fourthly, the “coiffure à l’espagnole,” or Spanish head-dress. The latter deserves some notice on account of its elegance and singularity. My readers can imagine the effect of a handsome Spanish toque, embroidered or braided in gold, and artistically placed at the back of the head, with the hair in curls all round the front. In addition, there were several plaits intermingled with ribbons and jewels, which fell lightly on the neck and floated in the wind. This head-dress met with little or no opposition. 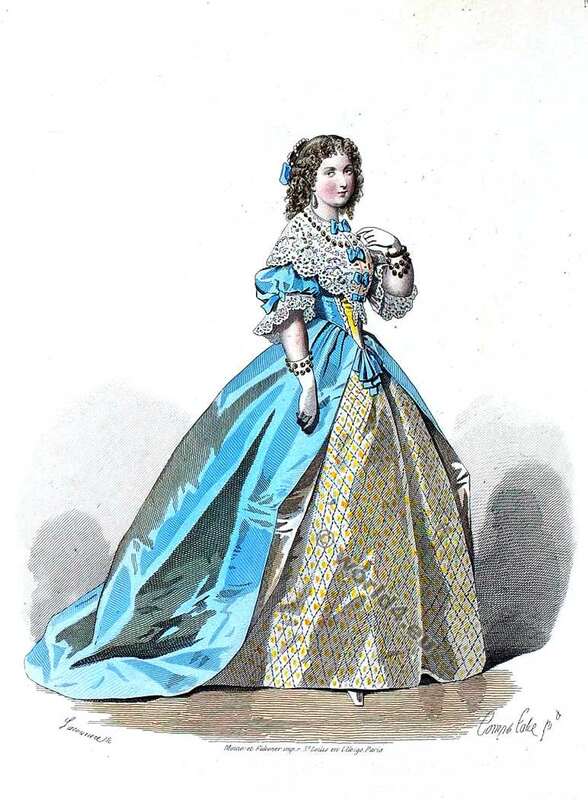 Transparent dresses “à l’ange,” or “à la vierge,” skirts of yellow satin, like those of Francion’s wife, and light head-dresses, were worn with very delicate and fanciful shoes. Venetian slippers were much prized, also coloured shoes with high heels. 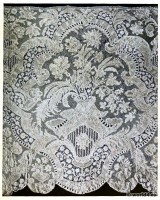 During the reign of Henri IV., Venetian and Florentine lace became so fashionable in France, that, in justice to native manufacturers, their importation was forbidden. But a system of fraudulent traffic was set up, and French vanity almost got the better of the law. 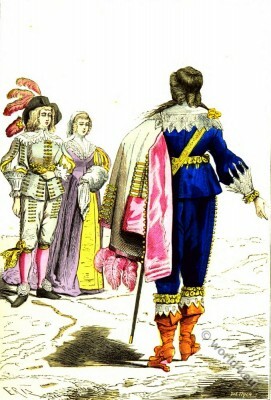 The king chose to banter his minister on the extravagance of women, and Sully immediately took, certain steps which succeeded in temporarily stopping the excess of expenditure on dress. 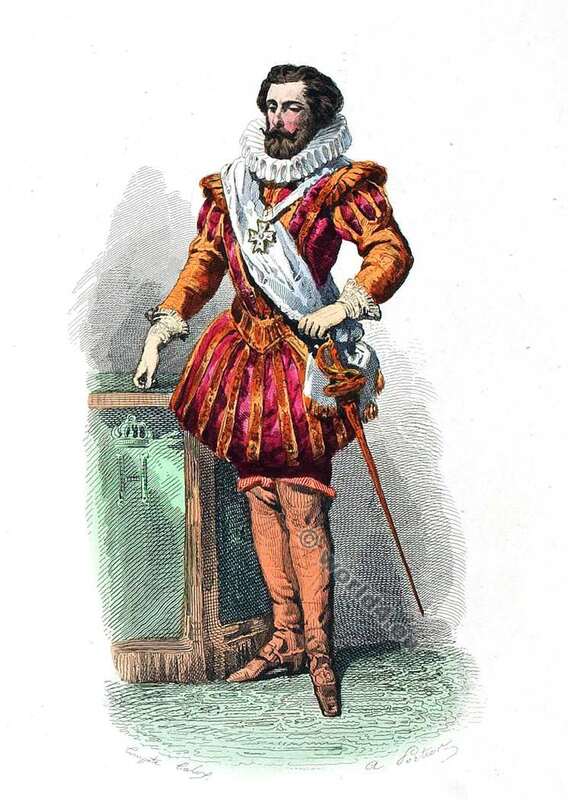 Louis XIII., the son of Henri III., endeavoured to walk in the path traced out by Sully, and in 1633 and 1634 he issued two fresh edicts lecturing Frenchwomen on their caprices. All the women instantly cried “Shame!” and numberless caricatures were published in defence of their cause. 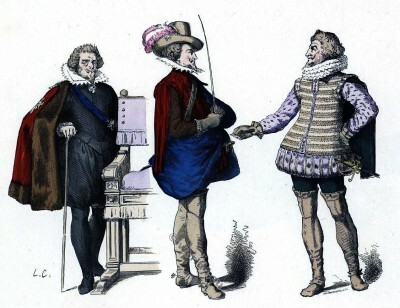 Lord and French nobles. 16th century. 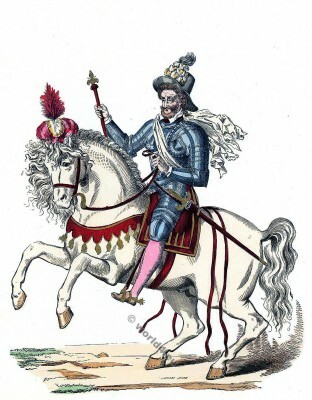 Reign of Louis XIII. From the table of Abraham Bosse in 1633. Bourgeoise de Paris au 16ème siècle. Here lieth Fashion! The ladies of the day must have laughed heartily in their sleeve at the notion of the death of Fashion; for how should they admit that it deserved to die? In spite of caricatures it did, in fact, survive, and in face of all the edicts took refuge at court, as its privileged sanctuary, and the natural home of ermine, gold-laced coats, lace, and jewels. Vaugelas, the grammarian, paid tribute to the power of Fashion, when he said: “Words are like fashions. 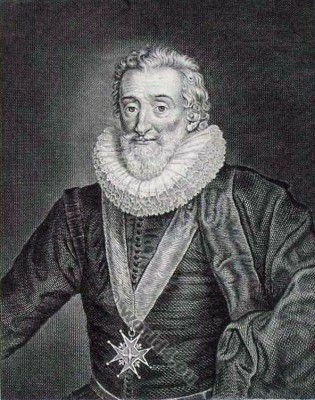 The wise, who know that they must speak and dress like every one else, do not immediately adopt the newest inventions of folly, but only those in general use, and it is equally unreasonable to endeavour to make words or to make fashions, or to refuse to abide by them after they have been publicly recognized.” In other words, custom overrides everything as regards both language and dress, and no one can decree innovations either in speech or in costume, with a chance of being obeyed. Nor did the Jansenists meet with better success when they attempted to deprive a certain lady of Easter Communion because she had trimmed her pocket-handkerchief with lace. Was it not the fashion? Knots of ribbon appeared on the dresses of all the bourgeoises, and even on those of the maid-servants of Moliere’s and Corneille’s time. There were tufts of ribbon on the skirts, bodices, sleeves, and hair. 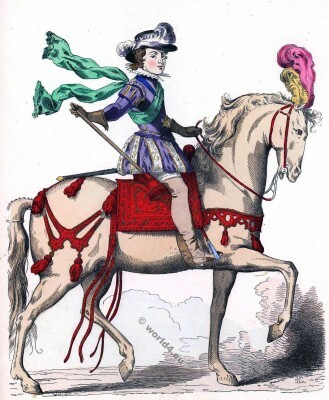 Bourgeoises felt the necessity of wearing ribbons at a time when cavaliers were profusely adorned with them. The whole French people were ribbon mad. 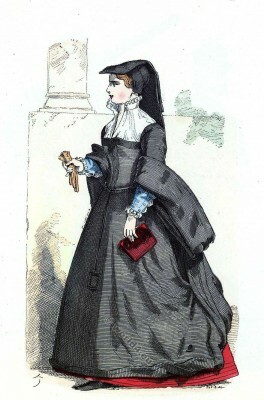 The “chaperon” or hood was still worn by bourgeoises. This was a small coif pointed on the forehead, and with an appendage behind that hung over the shoulders. The point was fastened down by pins. If we may believe the author of “La Chasse au Vieil Grognard,” “nobody was so well dressed, so clean, and so respectable” as the bourgeoises. 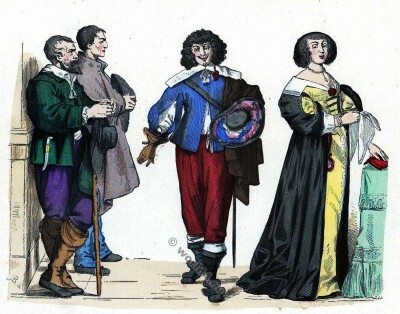 ” So well mannered, and so agreeable in their speech and conversation, that for the most part they with their daughters would be taken for noble ladies rather than for bourgeoises and shopkeepers.” Great ladies also condescended to wear hoods, but only in winter. 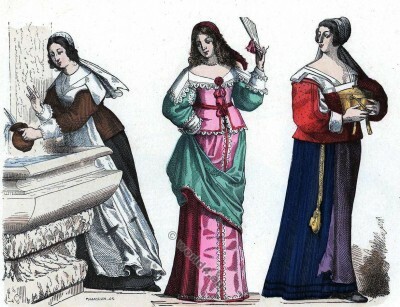 According to Ménage, Anne of Austria introduced the fashion of “garcettes,” which took the place of the padded wigs. The hair was frequently dressed “en tire-bouchons,” or corkscrew-fashion, and in loops, with a “culbute” or ribbon-bow fixed in the chignon. 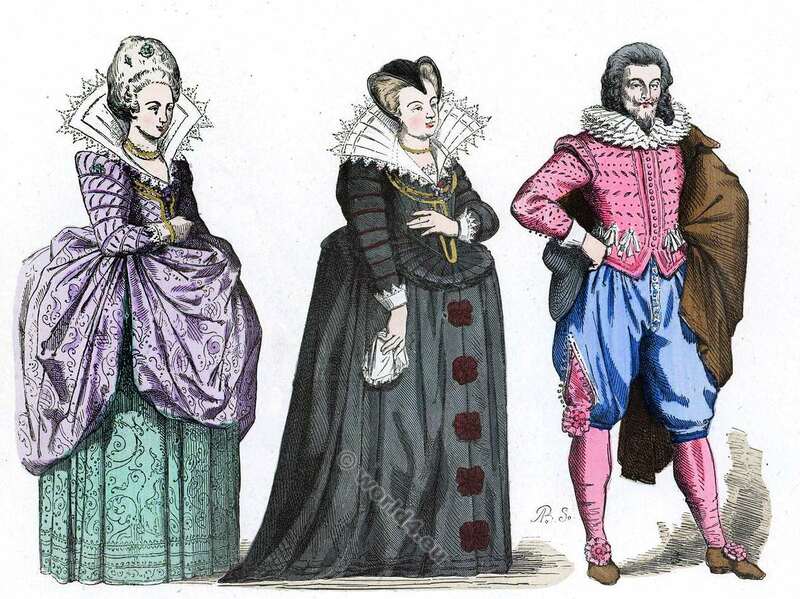 Dame et Gentilshommes d’environ 1584. 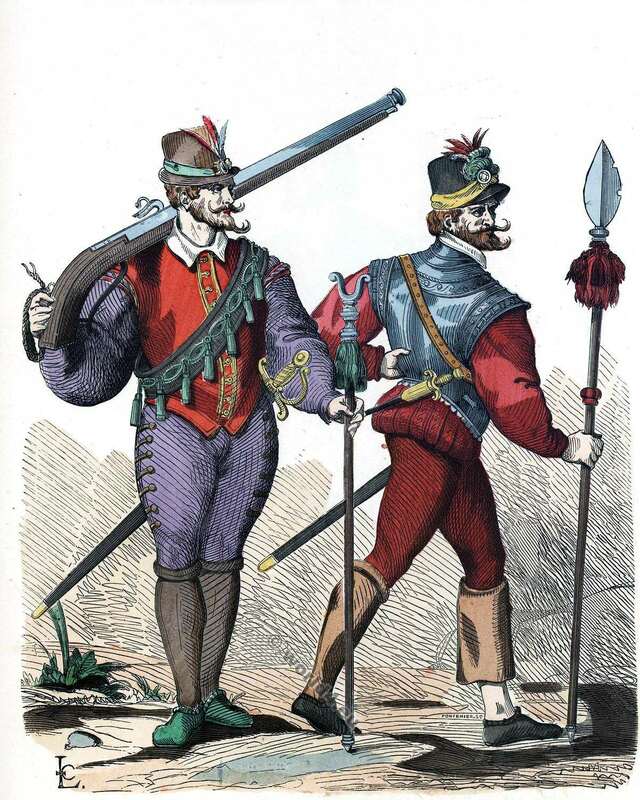 Mousquetaire et officier d’infanterie au 16ème siècle. D’après l’ouvrage de Willemin. 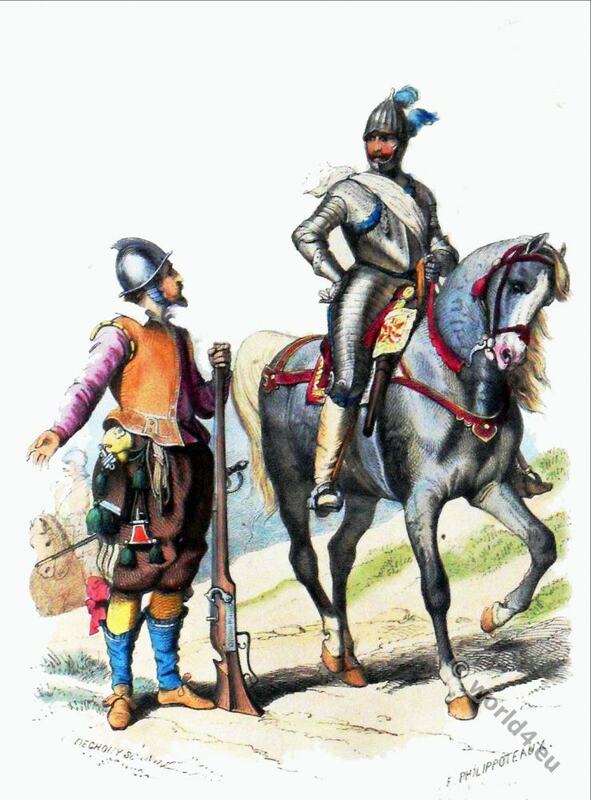 Un Gendarme en 1593. 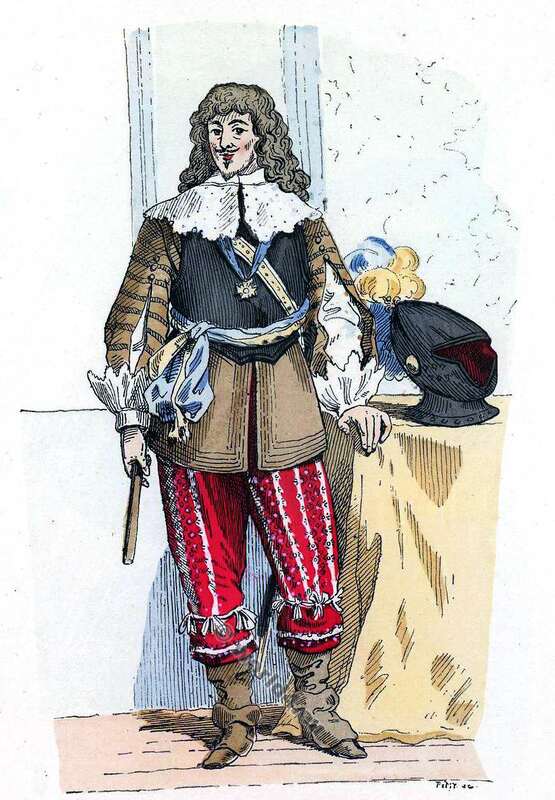 Un Gendarme de la Première compagnie des enfants d’honneur en 1596. Gentilshommes de 1615 a 1630. 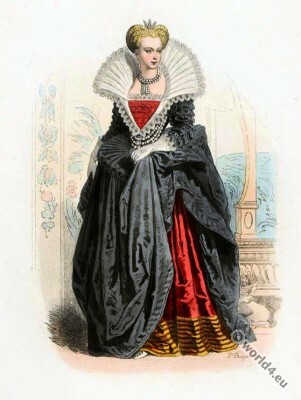 Dame de la cour. Marie de Médicis en Veuve. Gentilhomme, vers 1620. 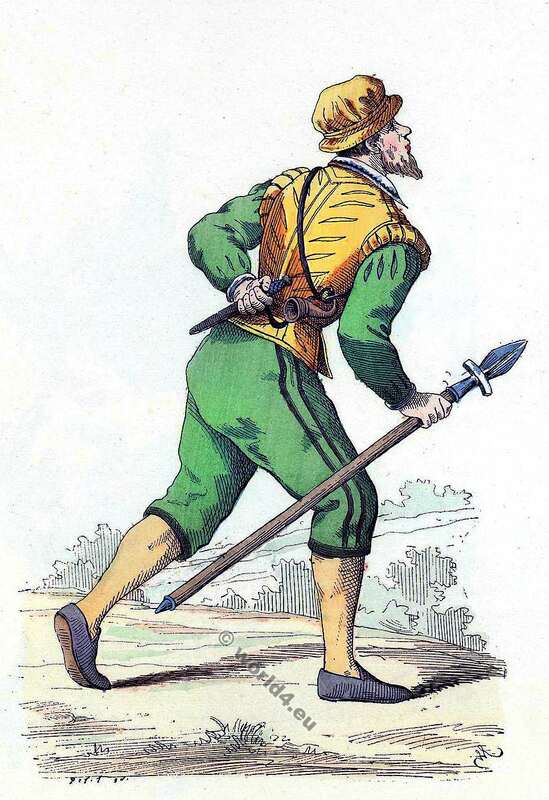 Chambrière. Dame en petite Toilette. Bourgeoise de Province (en 1640). Les premiers carrosses sous Louis XIII. 17ème siècle. Bibliothèque Nationale. Cabinet d’estampes d’après Raimbaut. Widows were never seen without a little coif on their heads. After two years’ deep mourning in “guimpe” and mantle, says a modern writer, widows were restricted for the rest of their lives, unless they married again, to black and white made in the simplest manner. Mme. 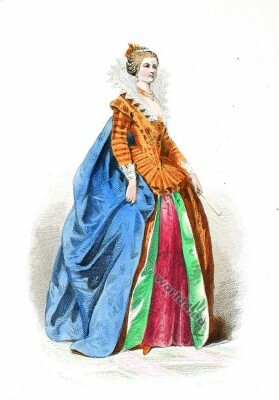 d’Aiguillon, the niece of Cardinal Richelieu (Marie Madeleine de Vignerot du Pontcourlay, Duchesse d’Aiguillon, Pair de France 1604–1675), was the first who ventured to wear colours after her husband’s death. Yet she did not throw aside the hood, which remained in existence under different names—sometimes “languette,” sometimes “bandeau” — until the close of the seventeenth century. Women of the people wore no gowns, only two petticoats and a bodice; the latter was sometimes laid aside for a “hongreline,” or loose bodice with deep basques, and in all cases an apron. They almost all possessed gold ornaments. 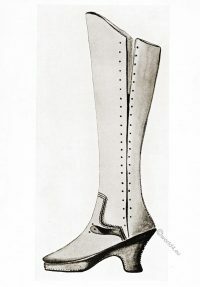 The girdle consisted of a “demi-ceint” of silver, and a broad band of silk ornamented with chased or enamelled gold-work. The “demi-ceint” was sometimes worth forty crowns; knives keys, scissors, &c., were suspended to it by a chain. Taken altogether, the dress of a maid-servant was rather complicated. Feminine attire altered very little under Louis XIII. We may note, however, the muff and the little “muff-dog,” seldom separated from his mistress. Vue du Louvre et vue du Pont-Neuf par les deux grandes vues du Paris. Jacques Callot 1629. Essences were still used, also white lead and vermilion. Every article of dress was scented, including shoes, and especially gloves. 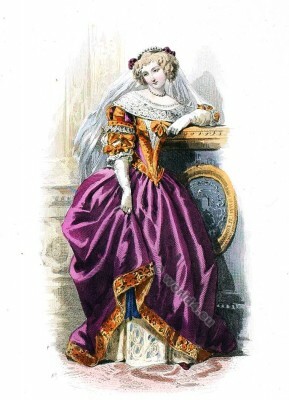 There were gloves “à l’occasion,” “à la nécessité,” ” à la cadenet,” “à la Phyllis,” “à la Frangipani” made out of highly perfumed skins, and gloves “à la Néroli,” so called from a princess of that name who had, it seems, invented an exquisite scent. For the benefit of their complexions, women applied lard to their faces at night. 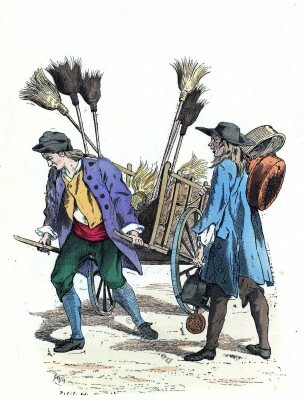 The “précieuses,” whom Molière thought ridiculous, and who refined our language until they got out of their depth, used to call fans “zephyrs.” This is rather an appropriate expression, and at any rate it is less affected than the euphemism of “baptized mules,” by which they designated the porters of their sedan chairs. Bright coloured silk stockings were still in fashion, and red satin shoes, or little slippers of various hues. We must call attention to one novelty, the appearance of patches, which are first mentioned in print in 1655, and continued to be in fashion until the time of the Regency, when seven principal patches were recognized. A patch was simply a small bit of black silk sticking-plaister, placed on the face, which looked all the fairer for the contrast. Each lady placed the patch to suit the expression of her countenance. In the midst of a promenade or street a great lady might be seen suddenly to stop, to open the patch-box she carried everywhere with her, to survey herself in the mirror which lined its lid, and quickly to replace a patch that had fallen off. 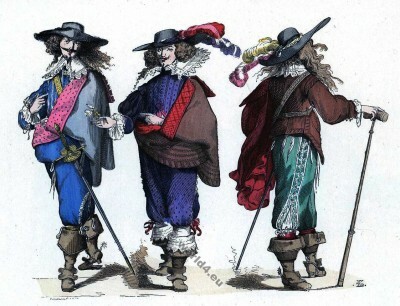 The fashion of patches was not, as might be imagined, a production of the seventeenth century. It was a reminiscence of early Roman times, during which even orators wore patches when speaking from the Tribune. We may truly say that there is nothing new under the sun. It is said that certain plaisters ordered as a remedy for headache had originally suggested these black spots, and what had been at first prescribed for health’s sake, was retained as an aid and accessory to the beauty of ladies who wished for artificial attractions. After endeavouring to animate and improve the countenance by patches, the next step was to conceal those faces to which nature had been unkind behind a mask; or else to envelope beauty in mystery, by making its presence doubtful, and exciting the curiosity of the incredulous. Masks originated in the reign of Henri II. 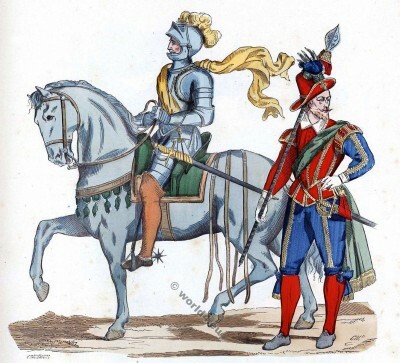 They reappeared in tenfold force under Louis XIII. Ladies avoided recognition by wearing black velvet masks, lined with white satin, that folded in two like a pocket-book. There were no strings with which to fix them on, but a slender silver bar ending in a button was fastened on the inside, and putting this between her teeth, the wearer could hold her mask in its place. Moreover, the tone of the voice was so altered by a mask, that many persons, anxious to avoid satirical remark, kept on their masks in public promenades, at balls, and even in church. “Parlerai-je de fantasques Qui portent dentelle à leurs masques, En chamarrant les trous des yeux, Croyant que le masque est au mieux? Masks called “loups” were supposed to protect the complexion from sunburn, but this was a mere pretext; the real object was to conceal the face of the wearer. Some ladies thus concealed their plainness, and the loup was also called “cache-laid,” or hide-ugly. 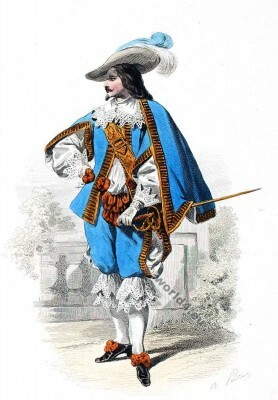 After the death of Louis XIII., when the minority of Louis XIV. afforded an excuse for the troubles of the Fronde, when the great ladies meddled with politics, directed insurrectionary movements, and acquired the name of “belles frondeuses,” masks played a most important part. Conspiracies that had been hatched in boudoirs broke out in the streets, and women took up arms and placed themselves at the head of seditious parties. 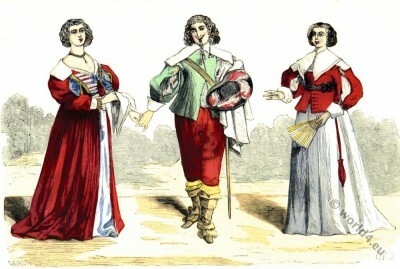 Cardinal Mazarin used to say: “There are three women in France capable of governing or of upsetting three kingdoms: the Duchesse de Longueville, the Princesse Palatine, and the Duchesse de Chevreuse.” These ladies used to go, masked, to the councils of Beaufort or of Condé, so as to escape the observation of the enemies of their cause. There are portraits in existence of that arch-Frondeuse the Duchesse de Longueville. She is represented with helmet and cuirass; her air and attitude are those of a heroine. Several princesses took, her for their model; and the period is one of note as regards fashion, especially for great diversity in dress. No commands were laid on great lords and ladies in those times of anarchy among the nobles. There was ample liberty, not to say licence, in dress. 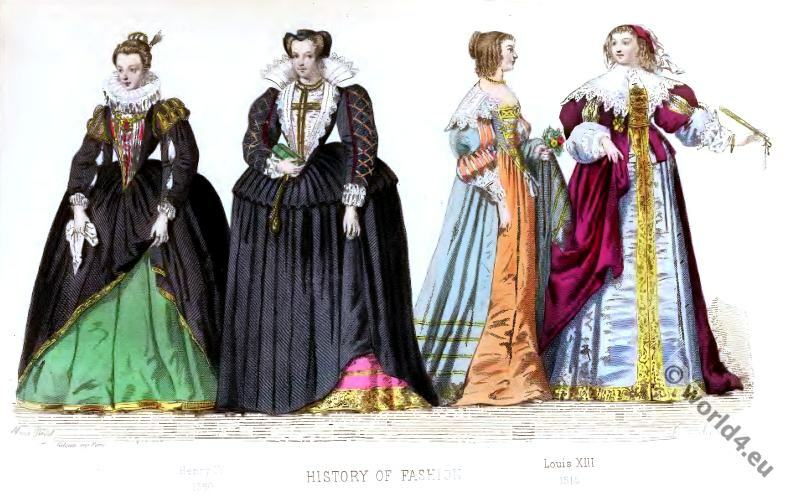 “The women,” says a contemporary writer, “shone in jewels at a ball given by Anne of Austria, and as much as they could in beauty also; and others in embroidery, feathers, ribbons, and good looks, each according to her means and the gifts of nature.” But for them liberty in dress was not destined to be of long duration. Italian bobbin made flounce 16th century. 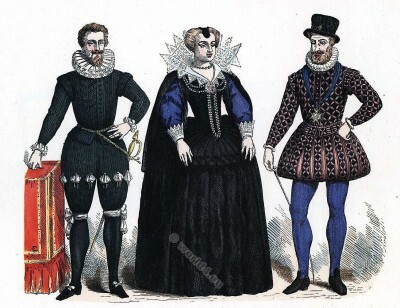 Renaissance fashion. 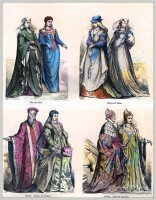 Italy 16th century clothing.